Greetings and salutations to all of my cherished music video programmer friends! It’s Andy Gesner and the staff from HIP Video Promo with another must see animated clip. If there’s something we love to see here at HIP, it’s a video director and band so in sync with each other that every shot and animated brushstroke in a clip perfectly captures the group’s aesthetic. Inkwell is a new band from Florida just beginning their rise to national recognition, and they’ve got a terrific weapon in their arsenal: artist and graphic designer Shane Douberly. Douberly, also a Floridian, has been painting and illustrating books for nearly a decade, and he’s developed a personal and immediately recognizable style. His faces are angular and rapt with wonder, his bodies are oddly elongated and dream-distorted, and his use of color is bold, unorthodox, and sometimes even hallucinatory. Nonetheless, there’s something indelible, realistic, and emotionally evocative about all his art – and Inkwell has made the most of his signature drawings. The clip for Inkwell’s “Just Take The Monkey And Leave”, the lead single from the newly-released These Stars Are Monsters, is a collaboration between the young illustrator and filmmaker William Waller, and an attempt to extend the feel and attitude of Douberly’s illustration to videotape. 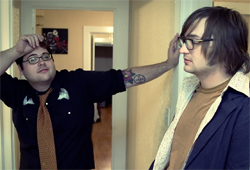 Douberly has drawn three “monsters” for the clip – they’re all characters featured in the animation – and they’ve also become icons for the band’s MySpace page and website. In fact, Douberly’s artwork is all over the Inkwell site, providing the group a visual motif that echoes their principal themes of fear, wonder, and innocence compromised. These Stars Are Monsters is a rich, melodic, and emotionally intense trip: twelve tracks of majestic alternative rock from a young band that has come into its voice. Travis Adams’s lyrics are refreshingly direct and filled with romantic longing, and his pained voice belies his occasional cynicism. “Just Take The Monkey And Leave”, the first song on These Stars Are Monsters and the gateway to the set, introduces both sides of Inkwell’s personality – the track begins as a guitar rave-up before melting into a fragile, spacy bridge and outro. Waller and Douberly’s breathtaking clip for “Just Take The Monkey And Leave” is an allegorical examination of the instability and ambivalence suggested by Adams’s performance. It begins with a drawing of a boy’s suburban bedroom – colorful, comfortable, and warm. But the child is shocked out of his complacency by the monsters under his bed (those same Sendak-influenced Douberly monsters that have become part of Inkwell’s iconography) and chased from his room into a dark and impersonal city. Luckily, his little sister sees his flight from the house, designs an avenging robot, and chases after him. The brother is pinned in an alleyway and harassed by the monsters – until the robot arrives and unmasks the assailants as ordinary schoolyard bullies. They’re knocked into the sky and end up hanging on stars, while the siblings ride the rocket-propelled robot into the sunset. It is our great pleasure to work together with Brad Fischetti and all of the folks at One Eleven Records to bring you this incredible artist. They have been kind enough to supply us with plenty of copies of These Stars Are Monsters for all of your on-air giveaway needs. If you need more info, call Andy Gesner at 732-613-1779 or e-mail us at info@HIPVideoPromo.com . You can also visit www.111Records.com to find out more about Inkwell.